I was entertained to see Mikal only recently noticed Aaron Sorkin wrote the four items he mentions. I have been a Sorkin fan for years now, and personally think the West Wing was never as good after he left at the end of season 4. Though I have not yet seen it, and it has not received great reviews in the US, the new post West Wing show from Sorkin, Studio 60 on the Sunset Strip probably still has some classic Sorkinesque banter and writing and is likely to be entertaining also. Ahh Aaron Sorkin and Joss Wheedon, without the two of them no television out of the US would not have been worth watching in the past 10 years I think. The Time Bandit at the Carillion (fullsize) Since I bought the Floozy I have become reasonably confident in keeping tippy boats upright. I think it has been good learning to paddle tippy boats on a surf ski, I did not have to worry much about falling off as I could get right back on. However the ski has two major draw backs I find. The most annoying one is that it is too small for me. It really is suited to someone under 5 foot 10 rather than someone over 6 foot so I always had my knees a bit high. 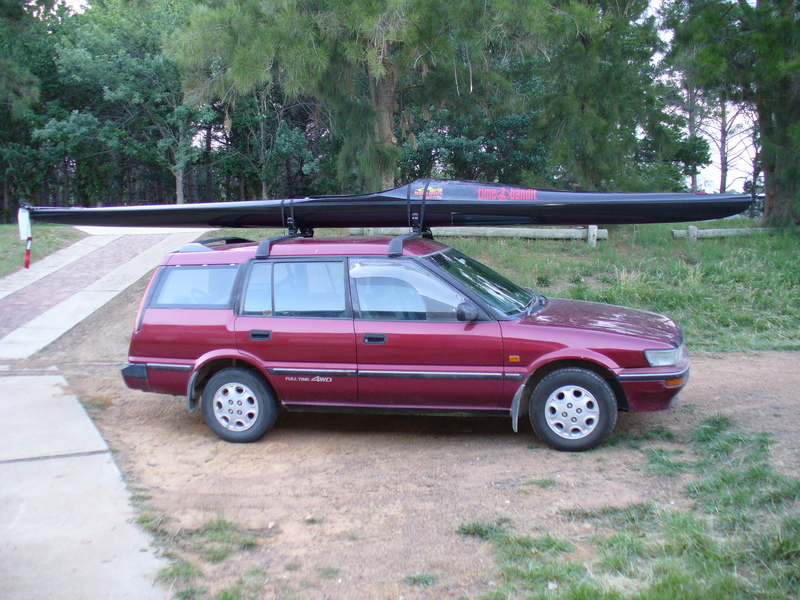 The other problem is in the middle of a Canberra winter paddling a surf ski is not my first choice of water vessel. This winter I paddled my Mirage most of the time, which meant I had to find someone to paddle with all winter, however I did make it out there a lot which was good. Sure I can get a wet suit or some other attire that would make paddling a surf ski in winter bearable however when taken with the fact the ski is a bit small for me it seems a new boat may be a better idea. Thus when Matt finally decided to go ahead and sell his Time Bandit (which he bought of Ado who had purchased it new last year) I was keen to buy it from him. This of course is the 6.2 metre long new toy I have been referring to the last few days. I have taken it out paddling twice now, and damn it is a nice boat. First with Danealle on Sunday arvo down to the governor general's place and back from Yarralumla bay. Then today across to the Carillion in rather windy conditions (waves washing over the cockpit a bit coming from three directions as I came under Commonwealth Ave bridge). So apart from knowing I need to buy a spray skirt for the boat I must say I am happy to say it stays up well and can handle pretty nasty conditions well. Sure I was nervous at times today on the water but I kept it upright and never really felt close to falling in. I did however wuss out of paddling back and went and got a lift with friends I met at the Carillion back to get my car and pick up the boat (thus I also have photos (medium, fullsize) of the new boat on top of the car). I have yet to choose a name for this boat, and as the first name for my Mirage was a failure and it took a while to find the name Matilda for it I am in no rush. 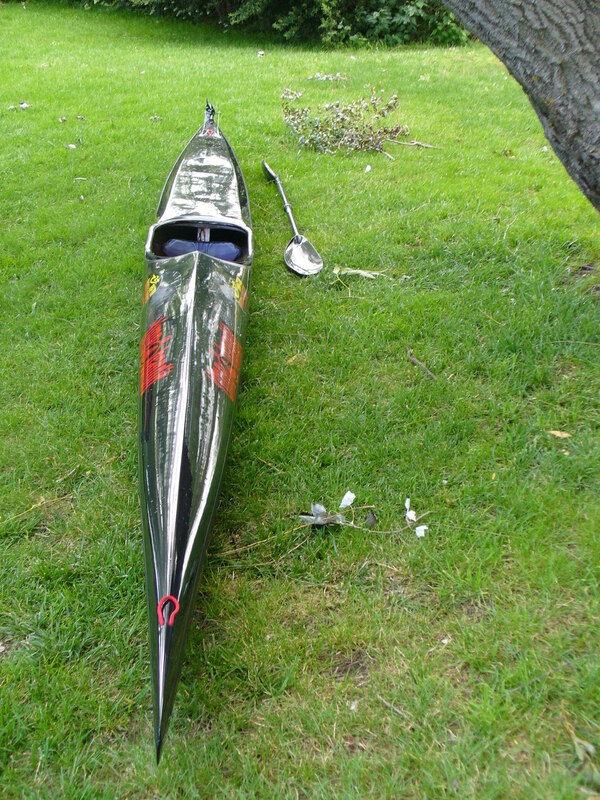 This purchase does increase my kayak collection, as suggested in the title N+1 being applied to kayaks, however I do wish to sell the Floozy as it really is small for me and the primary positive of owning a surf ski (the ability to use it in the surf and play around there) is not something I go and do much (I hardly seem to get to the coast often) I will be better off selling it. A few months back I bought a pair of Saucony shoes, usually I buy Asics, however trying these on they felt good and seemed a reasonably good shoe. Today I while out for a short run I had to stop briefly to get a grass seed out of my shoe that was hurting. While doing this I noticed parts of the sole were coming off. The shoe is a Saucony ProGrid Hurricane 9. I have admittedly done a few KM in these shoes since getting them, however I still have some almost ancient Asics that have done a lot more than these with soles in tact, the reason I do not run in them so much now is they seem to be lacking in cushioning and promote blisters more than newer shoes. However I do have to take into consideration these Saucony shoes are a light weight shoe compared to the Trubaco shoes from Asics in question and another pair I have of them that is still going strong. At least the Canberra Runners Shop club sale is on currently and I can probably get a good deal on a new light weight running shoe, probably revert to using Asics and see if I get better life from their lighter shoes. Last weekend in Sydney I bought a pair of Lafuma (Active Trail Pro) shoes, though this is to be a race shoe for longer stuff, looks like a great trail shoe, though a little bit sturdy for running around on bitumen (given the option something lighter can be used). I had hoped to avoid buying new shoes for a month or two at least, especially as I blew my toy budget for a little while on the new 6.2 metre black toy I have mentioned a few times in the past few days. Well it appears there are hints of the English translation of the 4th Watch series book by Sergei Lukyanenko appearing on Amazon and a few other places. Alas it appears the translation will not be out in January. Instead it looks like we will have to wait until July for the paperback (strangely it seems the hardback will be released later in August). I guess on the plus side there are also rumours around that he may write another novel in the series after the 4th, though waiting for English translation will extend that out even further. This morning I headed out to sparrow for a cruisy mtb ride with DeathMarch and PaulC, I realised when I got there I had forgotten my Garmin, I obviously still have not learnt to always take it along for exercise. The ride was fun, though sparrow hill is not technically challenging it really is an absolute hoot to ride through. I then did some lawn mowing this afternoon, though due to the large period of time between mowings it resembled a jungle almost so in one and a half hours of mowing I only got the back of the back yard done. More of that tomorrow, I then was heading over to the lake to paddle with Danealle. It was a pleasant and calm morning on the water so I had been hoping it would stay calm, however by 4pm the wind had picked up a bit, Danealle and I arrived at the shed to find small waves washing over the launching area and a bit of head on wind. 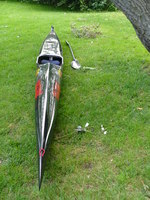 However with my new toy as yet untried I was keen to get out there on it rather than take Matilda out, so I hopped in, found the new boat is pretty stable all things considered and assured Danealle I would be fine to stay upright in the conditions. So we headed off for a fun 8 KM or so paddling, and once more I did not have my garmin on, though I had taken it to the shed, we were cruising around so I did not feel the need to wear it. I meant to do more mowing when I got home, however did no feel like it so will finish it tomorrow after a lap of Cotter/Uriarra in the morning. I got home from a 17km run and after a shower and dinner actually thought to myself it may be a good idea to watch some tv. Looking at the guide I was pleased to see RocKwiz was on. I really enjoy this show due to the fun atmosphere of it. Sure I love Spicks and Specks too, but this is more fun I reckon. Paul Kelly performed his Gravy song on it, the thing that I was most surprised to note there is how old he was looking. Clare Bowditch performed a song with Tex Perkins which was pretty good. Another song they had Tim Friedman on piano and some woman singing a cover of Joni Mitchell's song River. I love this song and have heard some mighty fine covers of it as well as a few originals from Joni. However this was not a good cover, Tim's piano was alright, though a bit powerful sounding, I think that may have had something to do with the audio setup in the theatre though, some other performers were drowned out by instruments a bit too. However the song was appalling, the woman had timing and delivery of the lyrics too far off and out of kilter. Sure I know when covering an artist can and should put their own spin on the work, however in this case I was cringing and had to change channels for a while it was too messed up. Otherwise today has been kind of cruisy, was meant to go for a nice 90KM road ride this morning with friends, however heavy rain all morning meant that was a no go. I went shopping and grabbed some presents for people, then headed to the boat shed to put my new 6.2 metre long black fast toy in the shed. I had been intending to do the Maladjusted single speed race, however they called it off due to saturated forests and high winds. The run was good to at least get some exercise in, and I had not run since Tuesday due to being busy anyway. I had been hoping to watch a Billy Connolly in New Zealand show I noticed in the program, however when I could not find it on the tv after RocKwiz I looked again at the guide and realised it was only on a digital channel. My mythtv box could record it for me but I can not be bothered really. So I have not been able to do the paddle time trial for the past two weeks, however with the stitches removed I thought I could give it a go again last night. When I set a new PB a few weeks ago I was paddling a club TK1. Last night I took Mark's Rocket out for the time trial. I forgot to adjust the seat forward so could almost not reach the pedals properly, definitely could not leg drive properly. However I still managed to get a new PB over the course. 53:36 on my watch, rock on.